PASADENA, CA; April 30, 2013—Dr. 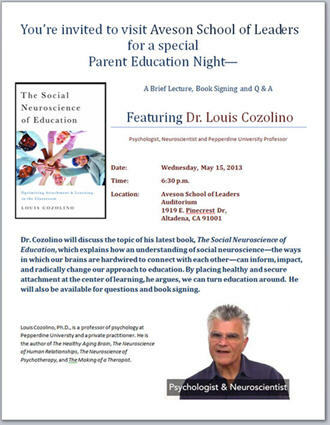 Louis Cozolino, a respected leader in the field of neuropsychotherapy and a psychology professor at Pepperdine University, will be available to speak, answer questions and sign books at Aveson School of Leaders (ASL) between 6:30 and 8:30 on Wednesday, May 15, 2013, in the ASL Auditorium located at 1919 E. Pinecrest Drive in Altadena, CA. The author of several previous works on social neuroscience—the study of how human brains are hardwired to connect with one another—Cozolino argues in his latest book, The Social Neuroscience of Education, that this same understanding can “inform, impact, and radically change” our approach to education. Most would agree that the American public education system could certainly use overhauling, but the difficulty lies in identifying how best to fix it. Cozolino suggests the place to begin is with the understanding that the human brain is a social organ and that its natural habitat for growing is in the context of secure attachment bonds and nurturing relationships. Unfortunately, our current educational model is based on the production industry instead of neurobiology. "This model has proven itself over the last 150 years and works exceptionally well for making automobiles, washing machines, and chicken nuggets," he says. But to turn out consistent products, you need raw materials that are all the same, production tools that are all the same, and a clear vision for the end product. This process doesn’t fit human neurobiology. Children, our raw materials, vary widely in their makeup, as do their teachers; and to cap it all off, we don't have a clear vision of our final product. Cozolino argues that we can no longer treat human beings as industrial products. "When a teacher begins to think of his or her classroom as an assembly line, it's time to make chicken nuggets," he says. In The Social Neuroscience of Education, he offers insights that can help educators and parents place healthy and secure attachment at the center of learning. Altadenablog/Altadena Online started in Oct. 2007, and has steadily grown to become Altadena’s main source of local news, regularly covering key events in Altadena. Pasadena Now is a 100% green, online "newspaperless." 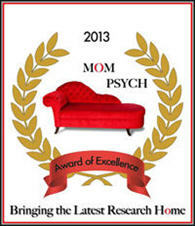 It does not stake out editorial positions, advance agendas, or endorse causes or candidates. Instead, Pasadena Now serves the communty by attempting to remain an impartial observer and transparent deliverer of accurate news and information.